"Goldsprints is back! Come out to the Bike Tech warehouse to enjoy a great time and support a wonderful cause! 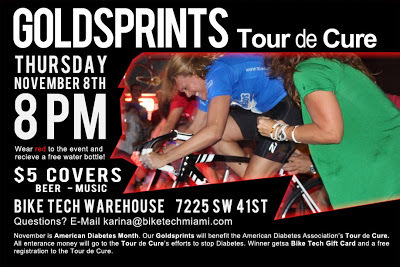 Since November is American Diabetes Month, our Goldsprints will benefit the American Diabetes Association's Tour de Cure. All proceeds will go to the Tour de Cure's efforts to stop diabetes.There will be a food truck, music, beer and of course the sprints! Bring 5 dollars to cover all drinks and an opportunity to race. Ride your bike out to the Goldsprints and get free admission. Bring your lock and we will provide a space for you to park your bike. 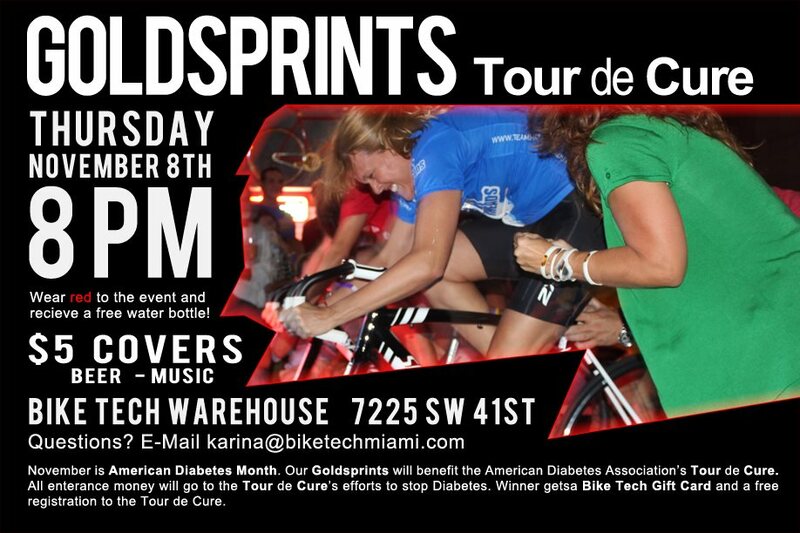 The winner of this month's sprints will receive a Bike Tech gift card and a free registration to the Tour de Cure! If you wear red to the event, you will get a free Bike Tech water bottle! Spread the word! Hope to see everyone there!! You can pre-register at either the Bird Road or Coral Way locations. Everyone is invited!"